Red Hill Brewery's mission to conceive and release ten different red beers to mark ten years of brewing has moved past the halfway mark. And for beer number six they've enlisted help from some old friends. While spending the winter months atop a mountain, they found time to call in to Bright Brewery, where Red Hill's Dave Golding joined Bright's Ryan Tyack and Tobi Dankert to brew the first batch. The exact same beer was then brewed the following day at Red Hill Brewery, producing around 2,000 litres in total. 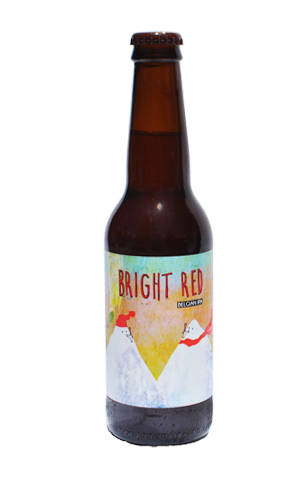 The beer they say is "born through a brewing friendship and a shared love for Victoria's alpine adventures" is a cloudy, red hued Belgian IPA. We're told that means "a floral and sweet fruity aroma", "layers of flavour that include grapefruit and sweet berries", "a soft hop bitterness [that] leads into a refreshingly tart finish from the Belgian yeast" in a beer that's "full bodied and moreish" and ideal, they reckon, for both winter and summer.